This is how most of the team guys run their tape. It does not go under the battery. What kind of tape works best? 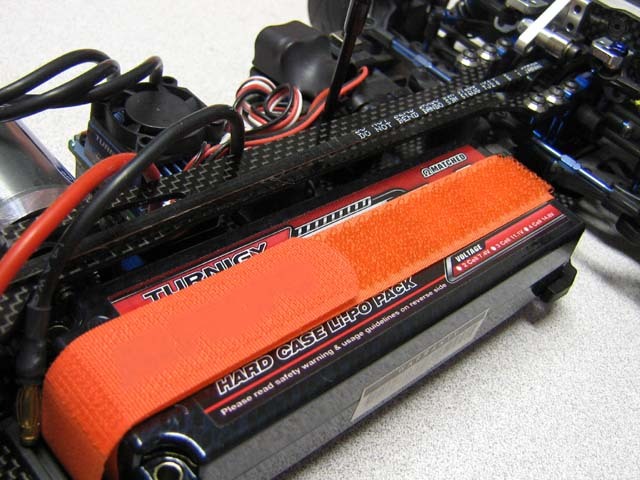 I have the lipo velcro'd to the chassis and hadn't though about how it raises the center gravity load. High quality fiber strapping tape. If you get the good stuff, one piece can last quite a while. Sliontech and Hudy for example. I think the sliontech stuff is sold in a Integy package in a few colors. 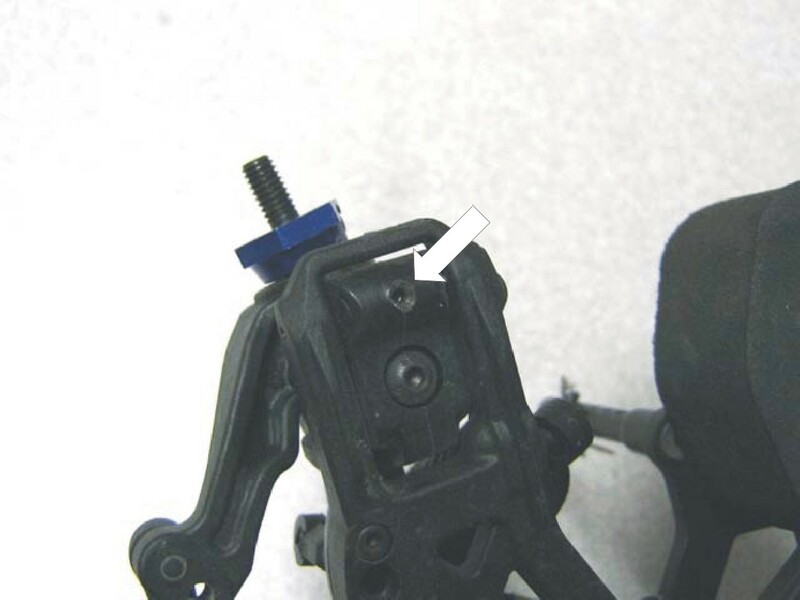 If you find any play on the front or rear suspension it would be from the rear hub or front C hub. The pins need to be pinned to tighten things up. On a XRay, the hubs are pre drilled for a set screw. 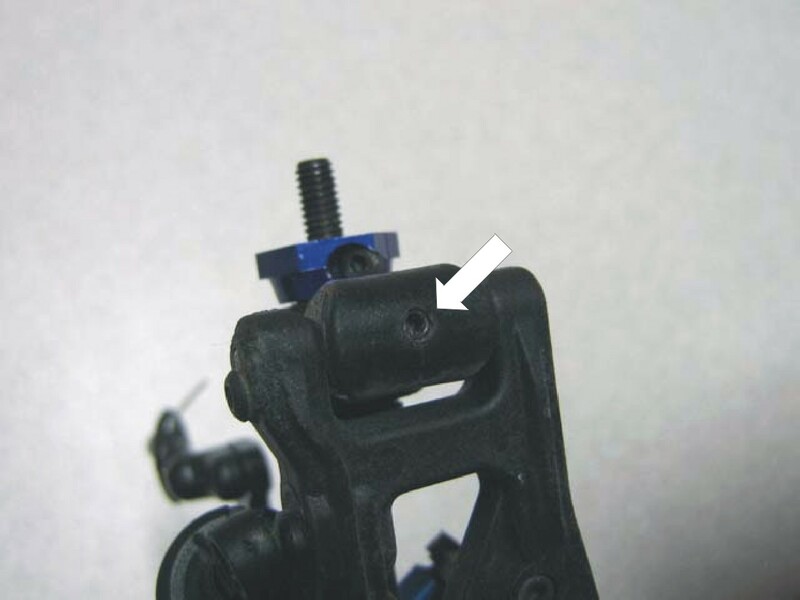 On the TC6, you can drill a 2.5mm small hole and put in a M3 setscrew to pin the pivot pin. It works great. Good stuff. For anyone using these, what is the correct size strap for this car? Also the top racing strap doesn't go under the battery. Just FYI. Any strap that is 21mm or less in width will work. Ours is 21mm exactly. Does anyone know of an aftermarket harder than stock foam bumper that is also wider than the stock one? The stock one doesn't even cover the front suspension at all....I might as well just take the thing off. The Parma bumper needs to be modified slightly because it is such a tight fit on the bumper bracket. It wants to tear one of the holes. I got one because it's supposed to help with saving front end parts, ended up with a torn bumper because it was too tight. Didn't hit anything more than normal. Maybe I got a bad one? I have gone to as low as 3.3 (approx). Be sure to check your motor temp from time to time. 3.5 to 3.7 with a 96t 64 pitch Spur with a D3 and LRP SS. Are you running Boost or Blinky ? Im going to be running 17.5 blinky(no boost/no timing). After building the kit and looking at the gearing chart(in the book), it was clear this car was intended for modified motors. And after reading the gear chart its clear I cant and want be using the 87t spur that came in the kit with a 175.5 motor. Im going to try to run a 72 or 68 spur on there. Last edited by nitrous36; 06-14-2012 at 12:10 PM.